I’m going to add an icon to the notifications I get from Facebook (since I get a lot of ’em), so they’ll be instantly identifiable in my Inbox. 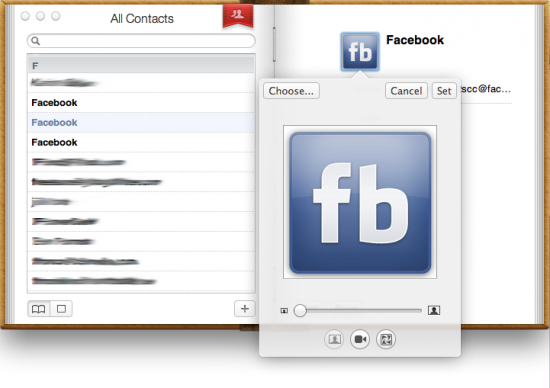 But you can do this with any contact in your Address Book, and add any image you want as that contact’s photo. If you really want to go nuts, you can add an image for every contact in your Address Book, but that would probably require more of a time investment than most people have. I’ve done it just for my most frequent contacts, and it really helps to see at-a-glance what’s new in my Inbox and who it’s from. 1) Fire up Address Book and find the contact you want to add an image to. 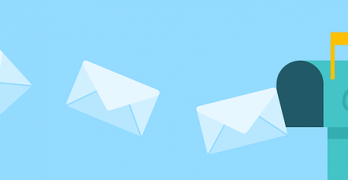 If your contact isn’t in Address Book yet, you can click on their address in the message header in your Inbox, and “Add to Address Book” will be one of the options in the drop-down menu that appears. 2) Double-click on the icon next to the name in the right pane. Then click on the “Choose…” button (see above). From there, you’ll get a drop-down box where you can select the image you want to use. You can choose from images saved to any folder on your computer, or from your iPhoto library. I’m going to use an “FB” icon I downloaded from the Internet. 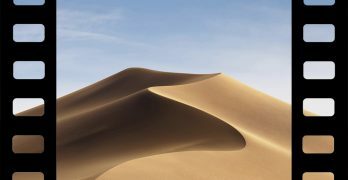 â€¢ Here’s a nifty option that’s only available in OS X Lion: in iPhoto there’s a new feature called Faces, which automatically recognizes faces in your pictures and asks you to identify them. Once you’ve done this, back in Address Book, you can select “Faces” under iPhoto, and use any of the faces there as contact photos. 3) Once you’ve selected your image, Address Book will let you set the cropping and zoom of it for use as the contact photo. Click the “Set” button, and you’re good to go. 4) You’ll have to restart Mail to see your new contact photo(s) show up, but they’ll automatically appear there beside new messages in your Inbox, as seen above.